Norwegian hydropower could make Norway the "green battery" of Europe—not by building new power plants, but by further developing the hydropower installations that were built out beginning at the turn of the last century. The Hydraulic Laboratory at the Norwegian University of Science and Technology (NTNU) is filled with models of hydroelectric dams and water tunnels. Norway's steep and scenic Geiranger fjord is also on display in miniature. Mini mountain boulders sluice down into the fjord at high speed in order to research the tsunami effect on land when the Åknes mountain massif eventually breaks apart and lands in the bay. There's also a brand new mini power plant, a 1:65 scale copy of Norway's Torpa hydropower plant. With 147 meters of piping, it is not really that mini. It is the world's first physical model of a waterway with an air-cushioned surge chamber—a design that could be key to transforming Norway's hydropower network into an international resource, a green battery that could soak up Europe's excess wind and solar power and release it on demand. .
Doctoral student Kaspar Vereide designed the model and is studying new solutions for existing hydropower plants. The model provides answers to how the air-cushioned chamber can be optimally designed. Hydropower plant construction and research in Norway came to a near standstill after the last major expansion in the 1960s and 70s. 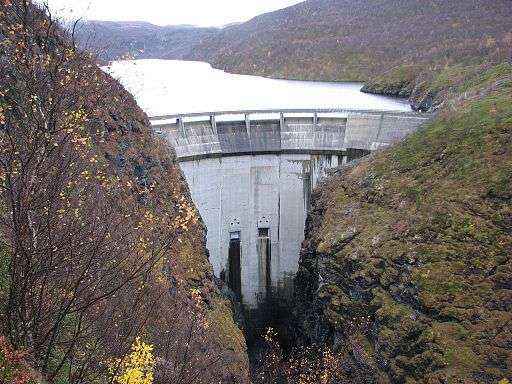 The country had developed what it needed, and today 96 per cent of the electricity in Norway comes from the country's 937 hydropower stations. Indeed, Norway is the sixth largest hydropower producer in the world—which is all the more amazing when you consider the entire country has just 5 million people. However, Norway has the capacity to produce much more energy from hydropower and the potential to become Europe's "green battery". The idea behind a "green battery" is that excess power from Europe's growing network of solar arrays and wind farms could be sent to Norway to pump water up from lower reservoirs to higher reservoirs. Then, when Europe needs this power again, Norway just opens the tap and lets the water spin through its hydropower turbines. The trick, is however, that Norway's hydropower plants were not necessarily designed for this on-and-off operation scheme. Thus, improving existing power plants, rather than developing new ones, is the focus of ongoing research. The first step is to solve the challenges associated with increasing the capacity and flexibility of existing plants. Vereide represents a new generation of hydropower researchers moving into Norway's so-called first energy revolution: electricity from water. Electricity represents the modern era, and at the end of the 1800s two geniuses fought a fierce battle over the basis for future electrical technology. Thomas Alva Edison, inventor of the incandescent lamp, said the electrical era should be based on the principle of direct current (DC). Nikola Tesla, who worked with Edison, was just as sure that alternating current (AC) was the future. And both were equally convinced that they held the solution. This disagreement between two intelligent and strong personalities led Tesla to split from Edison and establish his own firm, Tesla Electric Light & Manufacturing. Here he produced pioneering inventions, and among his most important ones were neon lights, radio technology, the induction motor, robotics, turbines for hydropower – and AC. When he died he held 700 patents. Tesla turned out to be right about which current the modern world would be based on. Through his inventions he laid the foundation for much of our modern technology, including AC. AC requires less energy to transport than DC, and it loses less energy during transport. AC is also less dangerous, and this was the main reason that AC became the choice at that time. In direct current, the electrons all flow in the same direction, whereas in alternating current the electrons move back and forth. In the European electricity grid, they do this 50 times per second, which translates to power being generated at a frequency of 50 Hz (Hertz) in European countries. "Electrical systems and equipment are made for this rate, so it's important that the rate remains stable at 50 Hz. You could destroy all the electronics in the country if the frequency in the Norwegian power grid were to go higher or lower. The hydropower plants control this frequency, since frequency is a result of the amount of power being produced and used at any given time," says Vereide. "For example," he says, "if a smelting plant suddenly has to stop because a tree has fallen onto nearby power lines, you're immediately producing too much electricity compared to what's being used. This causes the electrical frequency to increase, and the challenge is to bring down production quickly enough." Or in the opposite scenario: raising production quickly enough when electrical consumption increases, as when the rest of Europe suddenly needs the excess power they have sent to Norway to be stored. Water's inertia poses a problem, since speeding up or slowing down the water takes time. If it takes a long time to slow the water, it takes a correspondingly long time to reduce power production. In Norway, most large power plants are built with very long power tunnels to transport water from the reservoir to the hydroelectric plant. "Norwegian mountains are full of water tunnels. It's like an anthill. We have way more kilometres of water tunnels than we have road tunnels in this country," says Vereide. "The faster we can accelerate the water, the faster we can change the amount of generated current. And the solution lies in the surge chamber. First the water has to accelerate from the upper to the lower reservoir, and the length of that waterway can be many kilometres," says Vereide. If the water can be temporarily stored close to the power station, this reduces the length of the waterway to be accelerated. The surge chamber provides just this interim storage. This can be built by blowing out a cavern inside the water tunnel, near the turbine where electricity is generated. The caverns or surge chambers thus act as intermediate storage for the water and reduce the distance between the water reservoirs, speeding up the ability to modify water flow through the turbine. "Surge chambers offer a solution – but they also create a problem. This problem is called load fluctuation," Vereide says. If the plant is running at full blast and suddenly stops, the water level in the surge chamber increases. At the extreme, the water could overflow unmonitored into the top of the chamber, which normally has a ventilation tunnel. And when the plant starts up, or turns up the speed of the water flow, the opposite happens—the water level is drawn down. In the worst case, air could be sucked into the water tunnel, which could cause an uncontrolled blowout of air from the power plant. "So we have to be able to control these load fluctuations that occur. Among other things, it's important to determine how big surge chambers need to be to function best. My task is to figure out the optimal design for surge chambers," says Vereide. According to Vereide, this technology is highly relevant right now. Traditionally, plants have been run very smoothly and quietly, with few stops and starts to create these fluctuations. But a major expansion of existing hydropower plants is needed for Norway to become Europe's green battery in the future. The power plants will also need to be started and stopped much more often, and then the problem of load fluctuations increases significantly. "We'll benefit a lot from developing new technologies, both in order to keep electrical frequency stable and to run power plants more aggressively to serve a large market. A lot of opportunities exist for further development, and this is what I'm researching," Vereide says. "One of the improvements I'm working on is called throttling. There is a steel cone built into the connection between the tunnel and the surge chamber, where you can reduce the tunnel diameter. The restriction reduces the amount of water that can actually flow into and out of the surge chamber, and that lessens load fluctuations. "A key element is to find the optimal throttle size. I've come a long way with it, but the throttle has to be adapted to the unique specs of each power plant. I'm working on finding a formula that can provide the solution for each power plant. My dream is to find this formula." If he succeeds in figuring out the formula, he will have laid a golden egg for future hydropower industry. A distinctively Norwegian technology is the use of air-cushioned surge chambers in hydropower plants. This requires that the surge chamber, which provides intermediate storage for the water and which helps to control the frequency, is blasted out deep inside the mountain. This air-cushioned chamber has no opening to the air above and therefore cannot get rid of excess water. Instead the chamber is filled with compressed air, which changes with the water level. The air acts as a shock absorber does on cars and bicycles. When water flows into or out of the chamber, the air pressure dampens these fluctuations. "As the water level moves up and down, a thermodynamic is created. That is, the air is compressed or it expands, and the air temperature changes. To better understand the physics of this, I've developed a theoretical model that describes the thermodynamics. A scientific article about the model has been published in the Journal of Hydraulic Engineering: Thermodynamic Behavior and Heat Transfer in Closed Surge Tanks for Hydropower Plants. The better understood the thermodynamics inside the air-cushioned chamber is, the more control can be had over flow dynamics and the frequency of the electrical network, which is essential at increased power production. Vereide is using the model to increase knowledge about the physical properties and design of air-cushioned surge chambers. "So far, research has only a limited understanding of surge chamber thermodynamics. We haven't yet been able to quantify the transport of energy (heat) that occurs when the air is compressed in the air-cushioned chamber. This knowledge is important for an optimal design of air-cushioned chambers," says Vereide. The scheme is extremely profitable for Norway as an exit strategy out of oil. However, in the grand scale, E.On Netz has estimated, if I remember correctly, that building all of Norway's fjords full of pumped hydro storage would provide a capacity of 85 TWh. In the scale of the European network, the electricity demand according to Eurostat is approximately 3,100 TWh a year, so Norway, the entire country as a battery, would provide roughly 10 days worth of grid backup. In terms of energy security, that's not nearly enough. There is significant yearly variation in renewable energy outputs just as there are colder and hotter summers and winters. The gas grids across Europe for example contain about 3 months of strategic reserves, and the same goes for transportation fuels, coal, oil, etc. To provide the same level of security, one would need nine Norways. The fortunate bit is that we already have one. "AC requires less energy to transport than DC, and it loses less energy during transport. AC is also less dangerous, and this was the main reason that AC became the choice at that time." Well this statement is entirely wrong except for the very last part. Also, the voltage spikes due to load variations are much more dangerous to equipment than small frequency changes. MR166 you are correct, the main advantage AC has over DC is in the relative ease of reducing or increasing voltage. "in contrast with the more common alternating current (AC) systems. For long-distance transmission, HVDC systems may be less expensive and suffer lower electrical losses."